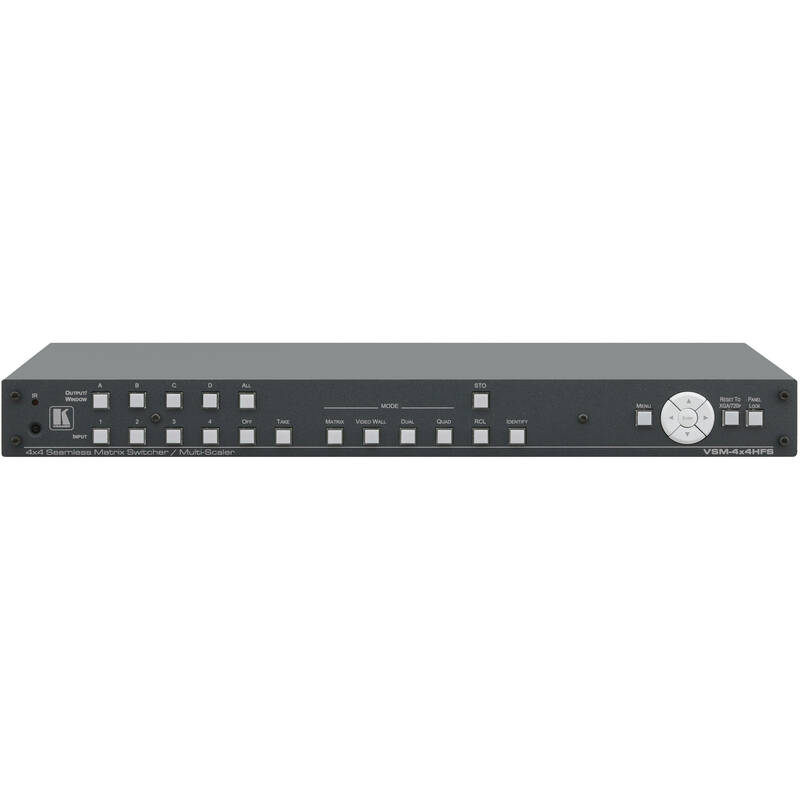 The 1 RU VSM-4x4HFS 4x4 Seamless Matrix Switcher/Multi-Scaler from Kramer can be used as a 4x4 matrix switcher, as well as a 2x2 video wall driver and dual/quad multi-viewer. The unit allows switching between video inputs with a clean frame-to-frame cut, without glitches or transition time. The VSM-4x4HFS supports HDMI Deep Color resolutions with up to eight channels of audio, and includes per-port HDCP and EDID settings. Box Dimensions (LxWxH) 21.6 x 13.2 x 4.3"
VSM-4x4HFS 4x4 Seamless Matrix Switcher/Multi-Scaler (1 RU) is rated 5.0 out of 5 by 2. Rated 5 out of 5 by DC7D from Fast switching, easy to use, very well made. I needed a solution for multi-source to multi-display switching for live event production. I needed to display content from 2-3 laptops, on two projectors, and a confidence monitor. Seamlessly and quickly switching between Power Point/Keynote presentations, videos, and websites when the event venue doesn't have a video system in place has been a challenge. Most solutions that are capable of switching properly are too slow, or are not affordable. 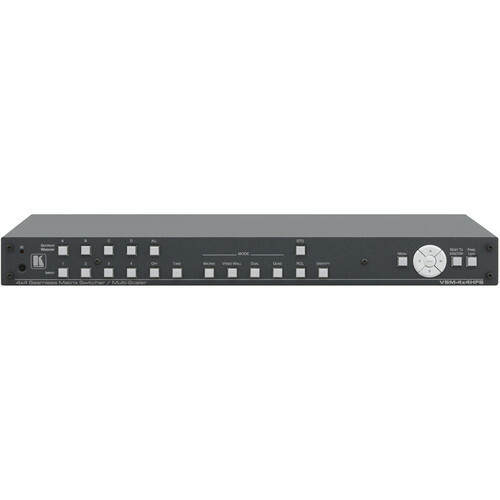 This switcher/scaler does exactly what I needed, and more. When I showed my event staff what the VSM-4x4HFS was capable of, they were excited to brainstorm new ways of incorporating it into all of our events. Rated 5 out of 5 by David from Expensive, but it does the job well. Fast, seamless switching between sources & destinations. My church is using this switch in Matrix mode. If I am using a converter box for long runs, to go to HDSDI out or say an Ethernet conversion, would this switcher still recognize and perform well with the signal?